Do Long Emails Still Work? With the way the Internet has evolved, the idea of long emails isn’t as welcomed nor as powerful as it used to be. Let’s look at the “average open rate.” It’s 10%. That means 90% of the people aren’t opening your email. That means people are either skimming OVER your email by reading the subject line OR they aren’t receiving your email at all. Emails aren’t catered to long form, but I’m hopeful that you already knew that. If you are in my List, you will see how quick and simple my emails are. TODAY, you will learn how this article is going to get your open rates through the roof! BEFORE WE GO ANY FURTHER.. Some other people take the EASY WAY OUT. You can be LAZY and link to a blog post with each new email, or ask people to make time to read long emails. But A LOT OF your subscribers will want to see something MORE than that and MOST of them do not have time to drink a cup of coffee and read your email. You want to provide amazing engagements. If you are promoting a new launch, you want them to pay attention and stay engaged! Emails are here to stay, it is the most effective way to communicate with your customers. HOW TO GET THEIR ATTENTION? When your email are being sent out, you do not know when or where they are going to read it. What if they are working and suddenly they received a notification? They can quickly glance at it and determine within few seconds if they want to read it or not. Do you want them to miss out on your opportunity? Most of you have seen my product launches and several offers. When I want to get more information out to you, I simply provide a better way to inform you. Webinar is probably my favorite method to engage with my list. Live Events, Q&A. Audio or Videos are a great way to provide long form emails into a simple and effective form of communication. Subject lines consist of “Live Event”, “Webinar” “Join Me Tonight Live”, and etc. Would you write out your tutorials, demonstrations or reviews? Or explain it in a simpler format? It is all about how you communicate and help your List visualize the product and make them want to purchase the products. SHOW your List how they can use the product or explain by writing out your tutorial. Which is BETTER? So, I want to provide other methods you can use to engage with your List. Instead of going with the audio method, if you are interested in providing visual content, YouTube might be the way to go. If your readers are more likely to browse through video clips of cats playing around, you might just get their attention with your YouTube video content. You get TWO benefits with YouTube. Your audience is able to see another alternative type of content and you are able you have a more relevant way of communicating with some of the readers in your List. YouTube has billions of views on their content every day. Chances are, people in your List will want to watch that video content you made, because your words are made into a visual expression, which help your readers better understand what you are talking about. So the odds are really on your favor by producing amazing video content and have this as an alternative method. Webinars work, period. Marketers use webinars to have high conversion rates on their leads. That means so should you. Launching a product? Invite your List to an exclusive webinar. The RSVP provides exclusivity and creates a sense of urgency. It opens the door of curiosity in the mind of your reader as they begin to await your influential insights. Since your webinar is at an exact time, you are able to funnel your list into one specific event at one specific time, increasing engagement through the roof. This method is not to be used lightly, but providing a webinar on special events can increase your conversions and returns. Need work on grabbing your List’s ATTENTION? A quick 10 second video to lure them in? These social media platforms provide great ways to produce quick and impactful content. Use this to get the attention of your readers, but don’t use them as your main method of delivery for significant events. The best way to utilize this type of content is to use it as a quick advert to get people excited enough to want to learn more about your event. This way, when your posts go live, they see a video that intrigues them, they click the link, then see the landing page you guide them to. These channels catch attention, help promote your events and allow you to connect with your audience in another unique way. So try these different methods today. Start changing it up to keep it fresh.Or mix it up by providing multiple ways of communication in that email. Add your call to action buttons (watch now, listen now) to your emails. Need help with what Call To Action words to use? While your at you should try our digital marketing software free! 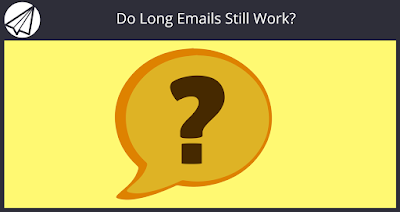 #DIGITAL: Do Long Emails Still Work?